It seems that since the dawn of the age of mobile phones, middle-aged people have been telling younger folks to leave the phone at home when getting out into nature. Something about the urge to post and share pretty pictures from mountaintops and waterfalls just rubbed them the wrong way. Not anymore. Now some water advocates are urging everyone to remember their phones so they can upload stream conditions — and celebratory pics — to contribute to an online GIS map of watersheds. It’s all thanks to a free app called Water Reporter. The technology, developed by the nonprofit Chesapeake Commons, empowers everyone with an iOS or Android phone to upload water photos into a data base that creates watershed-based photo maps. The reports are automatically sent to watershed groups who join the River Reporter. Water Reporter has been deployed by Downstream Project partners like Potomac Riverkeeper Network and West Virginia Rivers Coalition. Here’s a piece The Downstream Project produced from an interview at the 2017 River Rally in Grand Rapids, Michigan. 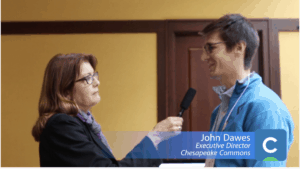 Chesapeake Commons’ John Dawes is featured in an interview with Mary Ellen Geist of Great Lakes Now.